These are the players in my life, all sharing the same stage. Well, hey gang! How's everybody doing? It's been a long, long time since I posted. My sister was telling me the other day she wished I would blog again, so I thought, "What the heck?" I can't guarantee I will blog with any regularity as I once did, but I will blog today. It's not that I haven't had anything to blog about these past couple of years; I'm just lazy, quite frankly. 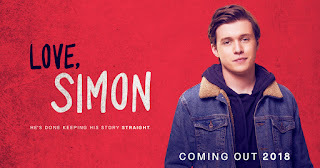 So Jonah and I went to see the movie Love, Simon today. If you don't know the film, it's about a young high schooler who is gay and struggling with coming out. He develops an anonymous online relationship with another closeted gay student and it's basically about him coming to terms with who he is. I really enjoyed it. I've read it's the first mainstream studio teen romantic comedy with a gay protagonist. Frankly, it would have been nice to have a movie like this when I was a young whipper-snapper. It's still tough for kids to come out of the closet, but man, it feels like it would be easier than when I was young or when those before me were struggling with their sexuality. The lead character of Simon is played by Nick Robinson, who I remember fondly from a popular series of Cox commercials a few years ago. I really found myself getting emotional during much of the film. There is one moment (spoiler alert) where he tells a friend he is gay, and it is the first time he says it out loud to another person, and I started crying because I remember all too well that feeling of unburdening myself of something I had held so deep inside for so long and how wonderful and scary it felt to finally release it. Another character, after learning Simon is gay, tells him (and I'm paraphrasing) that it was like he had lived so many years of his life holding his breath and now finally he was able to exhale. I thought that was such an apt metaphor. My friend once told me it was like like I had been living my whole life in black and whit and now it was in color (also a great metaphor). The movie itself at first reminded me of those 80s comedies I loved so much in my youth (The Breakfast Club, Sixteen Candles, Pretty in Pink, Say Anything, Ferris Bueller's Day Off, etc.) but really turned into something poignant and meaningful. I think anybody who is gay and struggling or anyone who has a gay family member should see it. What I liked, too, was how it approached just the concept that all high school students are at that age where they are trying to find themselves and know who they are. This one just happened to be gay. I also liked how realistic much of the film felt and yet how positively it treated the subject. The movie reminded me of so many facets of my life I experienced myself in dealing with my sexuality. I thought Nick Robinson was very good in the role. Really, I liked the whole cast. I was very touched by the film and am glad I saw it. But it also reminded me of where I once was and where I am now. Man, I'm so much happier and freer than I felt as that high school kid I once was. I wish those who fear homosexuality could see a film like this and understand what it's like to be on the other side. Anyway, I recommend seeing it. Thanks for sharing! Just like your older sister, your younger sister has also missed your blogs. She's the one who told me. I'm gay, I'm a Mormon, and I'm an actor. These are three identities that have really shaped and influenced who I have turned out to be. This blog originally started out as my journey of deciding to come out and embrace a gay relationship. My partner and I have been together about eight years; we had a commitment ceremony in December of 2008 and were legally married (in Utah of all places) five years later in December of 2013. Although I have been excommunicated from the LDS Church, I still cherish many aspects of my Mormonism. This blog contains my experiences as I continue to live outside the box.